The TIME project aims to time up to several hundred pulsars per day to search for pulsar glitches and study binary and millisecond pulsars, contributing to the global timing arrays and studies of relativistic gravity. Timing began in early 2014, and more than a dozen pulsars have been timed to date. 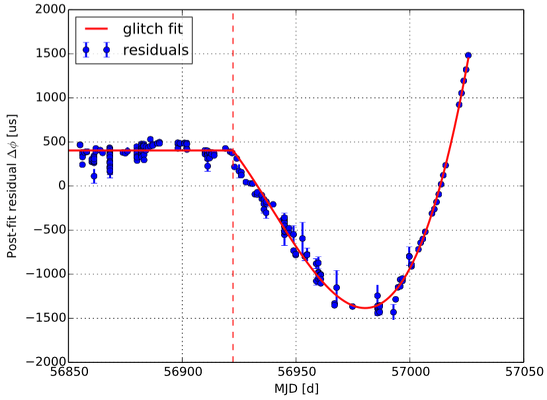 Most timing has been carried out in “incoherent” mode, in which the pulse timings from the individual modules in the telescope are averaged. The plot at right shows the pulsar Vela on over 100 modules, with the characteristic sweep in the arrival time of the pulse as a function of frequency, due to its passage through the interstellar medium (ISM). In “coherent” mode, we tie the modules of the telescope into a phased array, leading to much higher signal to noise measurements, and suppresion of radio frequency interference (RFI), from sources such as mobile phones. Five pulsars have been timed with this method to date (Jan 2015). At right we show the pulse profile for the well known Souther hemisphere millisecond pulsar, 0437-4715, after a “fan beam” was placed in the pulsar, and the data dedispersed and folded at the pulse period. The S/N ratio for the pulse is over 200. 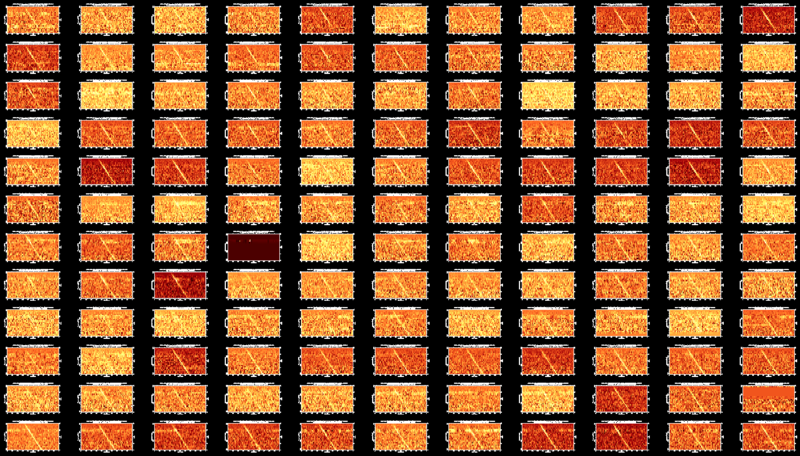 Our timing residuals are already just 2 microseconds on a small fraction of the final telescope performance. PhD student Fabian Jankowski has been timing about a dozen pulsars during the UTMOST commissioning phase, and particularly Vela, as it is the brightest in the Southern Hemisphere. He discovered a “glitch” in the timing from data in late 2014, shown in the plot below. 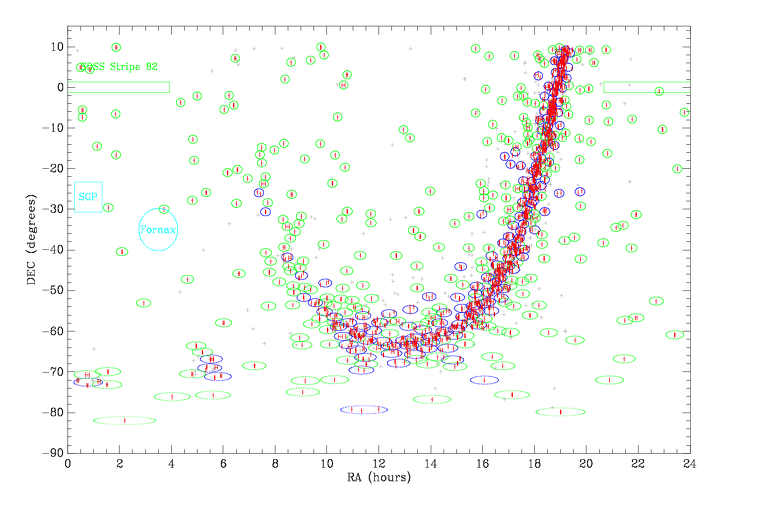 Glitch in the pulsar Vela is shown as a model fit (red line) against the timing measurements at Molonglo (blue dots). Credit: Fabian Jankowski. An ATEL (Astronomical Telegram) of the glitch discovery was sent out on 12/01/2015. Pulsars (red) for which a S/N of 20 can be achieved in 10 minutes (or less) at Molonglo with 352 modules operating at their theoretical gain. Green ellipses marks Molonglo beams with 1 pulsar, blue marks beams with 2 or more. Making multiple measurements per beam gives a key efficiency increase. 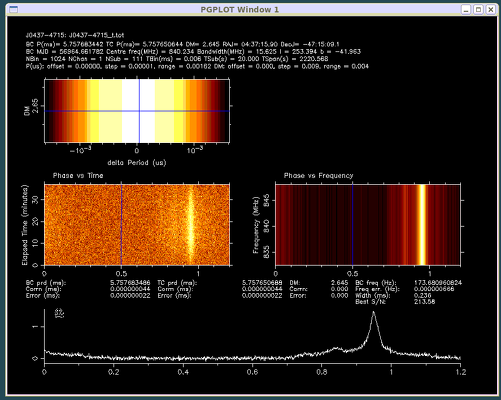 Red error bars (marked left to right) show how long each pulsar would be timed to get to S/N=20, based on an 843 MHz flux (computed from data in psrcat) : the scale is in hours as on the RA axis. Sky brightness at 843 MHz has been taken into account. The positions of several regions amenable to FRB hunting — at the SGP or along the SDSS Stripe 82 region (which has been imaged multiple times, deeply in the optical) are also shown. 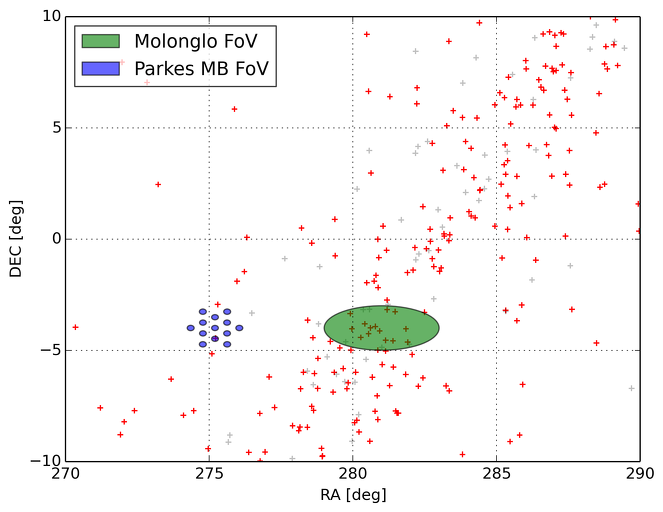 Comparison of Parkes multibeam field of view (blue) with that of Molonglo (green). In dense fields in the Galactic plane, Molonglo can observe and time 10 to 15 pulsars per Molonglo simultaneously, greatly increasing our surveying efficiency.